Timberwise Oxford were called out recently to a mid-terrace property in Oxford that appeared to be suffering with dampness. The property had a damp smell that appeared to be coming from the rear of the lounge although the clients could not pinpoint exactly what was causing this issue and therefore called our team for expert damp advice. When our surveyor carried out a survey, he inspected the surfaces of the walls, side boards and skirting of the room and initially found no evidence of damp, however, when using the protimeter to profile the wall to measure the moisture content within the walls high moisture levels were discovered. 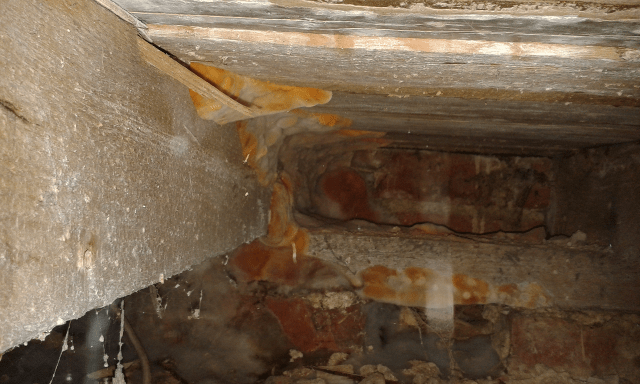 During the inspection, our surveyor also lifted the floorboards within the room to check the sub floor void and it was there, where the surveyor discovered an out break of Dry rot (Serpula lacrymans). The outbreak had spread beneath the flooring as a result of a leak from an adjacent leaking downpipe within a neighbouring property which had since been rectified. 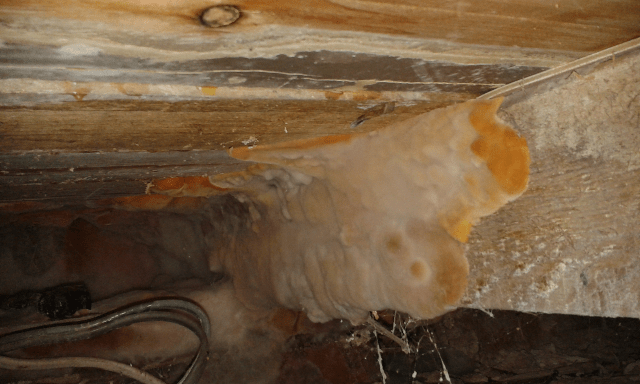 However, the water ingress caused by the leak had created the ideal conditions for true dry rot fungus (Serpula lacrymans) to grow. The fungal growth was initially noted to the party wall where it abutted the floorboards however upon lifting floorboards, a fruiting body and blanket mycelium was visible on the underside of the boards, the exposed brickwork and the timber joists. 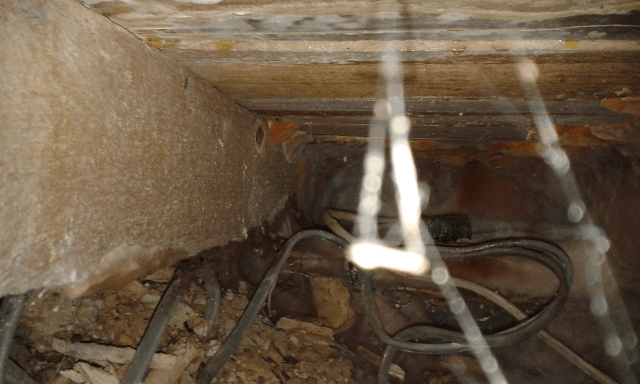 Our solution to rectify the problem was to was to, remove existing dot and dab plasterboard linings, timber floor joists, wall plates and floorboards that had been affected by the outbreak. Sterilisation fluid was utilised to ensure the area was thoroughly treated. New floorboards were installed over the new suspended floor timbers and pre-treated timber floor joists were fitted as necessary. In addition to the skirting board was replaced to match the existing and new plaster board lining was fixed utilising the dot and dab method. What to do if you suspect a damp problem in your property? If you suspect a damp problem within your property, call our damp specialists on 0800 288 8660 or complete our on-line survey request form to arrange a surveyor to visit. As this example shows what may appear to be a small damp issue can lead to other potentially larger problems that may go unseen for many years.